Brendan Francis: Thanks for asking us to share our unique perspectives. Fulton Francis was incorporated in Australia in 1999, our position in the market is, vendor independent subject matter experts in the category of Managed Print Services (MPS), we work with and for our clients to achieve their targeted category outcomes. MPS is currently led by printer OEM’s; i.e. HP, Xerox, Ricoh & Canon. Achieve previously unattained visibility over their MPS (assets, contracts, usage and TCO). Reduce their category-related TCO and workload. Brendan Francis: The pace of change in our industry is unsurprisingly slow. The contracting and service delivery model for MPS has barely changed in the past 20 years…it’s time! There is talk of transformation but the realities of the MPS category are that the current market leaders (printer OEM’s) make virtually all of their revenues and profit from leasing hardware and the provision of maintenance/toner. These are reliant on continued production of office print, as without print there is no need for hardware, maintenance or toner. Feeling it’s their only option customers engage print companies to manage their print and spend down; this not a realistic or reasonable expectation to place on a print provider. Transformation from print to digital will continue to be low on the agenda under the existing MPS model. Printer OEM’s are not leaders in digital transformation, and where they do have expertise, it is in pockets, not globally distributed. Customers, particularly enterprises, seeking transformation need to engage with leaders. The security, compliance and operational risks associated with not engaging with cloud and transformation leaders are too great to ignore. One platform, service, contract and relationship to manage for all of their global requirements, as opposed to repeatedly sourcing and managing these components in each geography they operate in. Flexibility in hardware and maintenance providers to meet the needs of their business units is preferred over a ‘one size fits all’ approach. It’s not possible for customers to achieve these outcomes via the fragmented OEM + Channel distribution model that MPS employs. 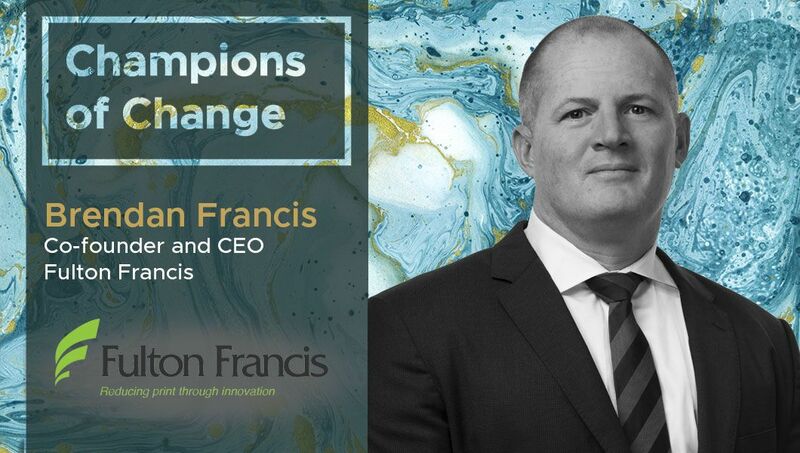 We at Fulton Francis, are excited by the real opportunity to drive once-in-a-generation change from MPS to a future model that is aligned with customer needs. Brendan Francis: It’s hard to narrow this down to one. Inevitably the print category will move to the cloud. Enterprise customers realize this burden is replicated by geography and it is something that they are keen to alleviate themselves of, particularly when they compare MPS to other outsourced IT categories. As long as the cloud infrastructure and support is provided by a cloud leader there is no reason why IT should continue to carry the MPS category burdens. Document and content level data must be provided to the customer. To drive transformation, customers need to understand the critical documents they are working with, the quantities of, the content within and the costs of the existing processes. We believe the MPS category is rich in such data, it’s just not being collected or it is but the data is not being shared with customers. Therefore customers are unable to make informed decisions around transformation opportunities. This is evidenced by the fact that at best most MPS customers are able to produce a high-level usage number of say 10M mono and 5M color prints per month. Our resulting question, and that of our clients, is “That’s 15M pages, of what exactly?”…a high-level number is not enough for us to identify and act upon transformation opportunities. The category must deliver greater flexibility. In the subscription and digital transformation era, MPS remains one of the most rigid categories. The decision an MPS customer makes today is the one they will live with for the next 4 – 5 years. The legacy MPS model does not cater well for customers who inevitably restructure or have changing requirements over the course of their contracts. The need is for that change to occur with minimal cost and disruption to the customers’ business…just as it would if we were adding a mobile app from a marketplace and then decided later that there was a more suitable app available; we want to terminate the old app and move to the new….without having to change our phone or pay excessive termination costs! A NEW contracting and billing model with greater customer flexibility will inevitably emerge to replace the old MPS model. Brendan Francis: The most significant, so far, is our proprietary contracts management system that enables us to support multi-vendor environments when working with global clients. The tasks of collating and assessing data in many different formats from various service providers’ reports and invoices was onerous. Consolidating data into a customized invoice and/or report in multiple currencies was time consuming, as was checking billed rate versus contracted rate. Brendan Francis: We outsource the majority of our IT. We have been fortunate to engage with partners who enable us to focus on servicing our customers. Brendan Francis: The bigger opportunity, rather than a challenge is, to leverage the capabilities of RPA & AI to support repetitive tasks in the most consistent way. The end result for a client should be a category that looks like it is managed by one team following the same processes and arriving at consistent outcomes that are supported by robust data/business cases. RPA & AI will also enable us to retain and grow the knowledge base within our company. Brendan Francis: We will certainly include marketplace in our offering but with business communications being so critical to our clients and replaced spend being so significant it’s not possible to automate or deliver all aspects via a marketplace. Books (preferably audio) about category transformers; PlayBigger, Zero to One, Unscaled, Blitzscaling and Subscribed are interesting reads. Podcasts: Finding Mastery, Pivot, Acquired, Equity, Legends & Losers (now Follow Your Different) and Masters of Scale. Daily email updates from Fortune, TechCrunch and CrunchBase News. Brendan Francis: By the looks of it I’m too busy listening to podcasts! I’m not much of a contributor on any social network but I do use LinkedIn frequently…the others I would be lucky to open once per month.